Hummingbird tattoos can turn out to be extremely lovely works of body art. Find out why these tiny birds have so much mystique. Hummingbirds are not your average feathered friends. It's not like you can look out your window and see one anytime. These beautiful little creatures are specialized feeders, so if you want to draw them to your yard, you either need to plant the appropriate nectar bearing plants or put up a hummingbird feeder in your garden. 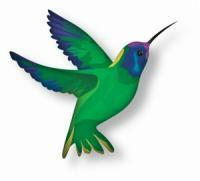 The hummingbird's low profile lies in stark contrast to it's beautiful plumage and amazing ability to hover in place. In fact, this combination of characteristics have led some cultures to believe that the hummingbird is a highly spiritual creature, one that doesn't spend all of its time in this realm. In ages past, this elusive bird was believed to have supernatural powers, especially when it comes to romance. Hummingbird feathers and even entire carcasses were worn as love charms, and sometimes used as ingredients in love potions. Native Americans tell a story of the hummingbird's attempted journey beyond the sun, and South American legends mark this bird as a water hoarder that was responsible for droughts. Today we can forego the so-called charms and folklore. Hummingbird tattoos offer us a way to pay homage to these incredibly lovely birds and look darn good while we're doing it. First and foremost, hummingbirds are colorful. You can certainly decide to go with a silhouette design if that's your preference, but you're missing out on an opportunity to play with color like you've never done before. 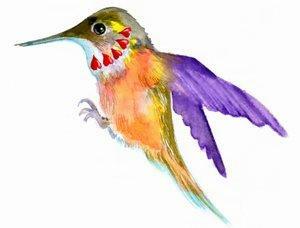 There are an amazing variety of hummingbirds, so you might choose a realistic rendering of your favorite type. On the other hand, these birds' mystical qualities make them prime candidates for a fantasy makeover. Choose the color combinations you love best, embellish those feathers with some flourishes and you'll have a very handsome custom tattoo. Of course, hummingbirds are usually associated with hovering over flowers and drinking nectar, so you can incorporate them into existing flower tattoos quite easily, or create a fresh design using your favorite blooms.They are often seen solo, but there's no reason you can't pair up your hummingbirds. A tattoo design like this could be used to commemorate a wedding or anniversary. Two hummingbirds set as facing mirror images could be used to create the outline of a heart; a perfect lover's tattoo. While hummingbirds seem to be a distinctly feminine tattoo, guys could wear this design by adding the name of a girlfriend, wife or daughter. As with any name tattoo, be sure the relationship is a lasting one before you commit to ink. Honestly, there's no bad place to place a hummingbird tat. They look good as small upper arm or ankle tattoos, but you can just as easily incorporate them into larger sleeves or back pieces. For a fantastic outer leg tattoo, place your hummingbird amongst some long stemmed flowers to make better use of the space. Hummingbirds can also be combined with other tattoo genres. Hummingbirds and fairy tats: How about a pixie riding on a hummingbird's back? Celtic style hummingbirds: An artist well versed in Celtic knot tattoos could create a knot work hummingbird. Tribal hummingbirds: If there is one style of tattoos that is currently more popular than any other, it has to be tribal designs. You can take almost any idea and translate it into the swishes and slashes of tribal art to turn out an absolutely fantastic tattoo. Hummingbirds are no exception.